Bill Lindeke at Streets.mn calls them “death roads.” Four-lane roads in urban areas can indeed be perilous. An 11-year-old boy was struck by a motorist on one of these roads recently in St. Paul. The media and others responded in typical fashion, deeming the crash an unavoidable “accident.” But the truth is these types of collisions are easy to prevent, Lindeke says. 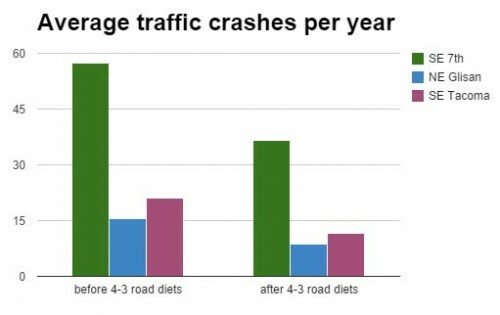 Converting four-lane roads to three lanes, a change commonly known as a “road diet,” makes them substantially safer, with little downside. Lindeke cites the data. #4) 3-lane roads increase biking and walking. After a 4-lane Death Road™ was fixed in San Francisco, “bicycle usage increased 37% during the PM peak hour,? the number of pedestrians increased 49% during the PM peak hour, [and]? public response has been overwhelmingly positive about this project.” That’s just one example; also, it’s common sense. #5) Fixing a Death Road™ is really cheap. Unlike expensive street reconstructions or concrete bumpouts, cities and counties can quickly, easily, and cheaply fix these Death Roads™. On the last point, Portland recently completed three road diets for less than $500,000. Chump change, when it comes to transportation projects. Elsewhere on the Network today: Family Friendly Cities wonders whether population density should be a key criterion when considering which cities are great for raising children. And Transitized weighs the value of certain types of transit data against the potential hassle of collecting it.